Purpose in life is most likely something that every human being desires. The devil is good at telling lies and even as I enter my old age, he continually lies to me and tells me I don’t have any purpose in life. Lies lies lies! The devil is the master of lies. The TRUTH is that God has a plan and purpose for everyone no matter what stage of life you are in. 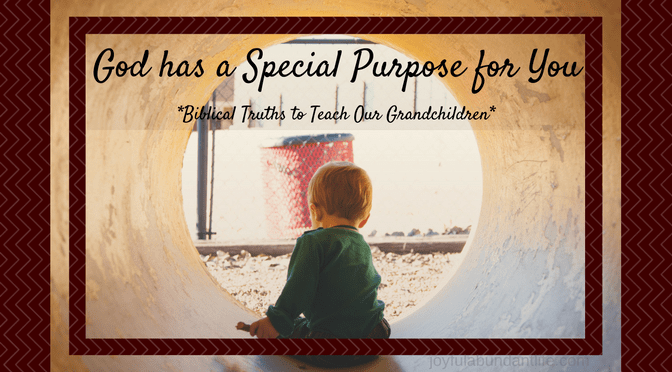 I want my grandchildren to realize that once they belong to God’s family, He is more than willing to guide them and show them His special plan for his/her life. It doesn’t matter who we are or where we live, God has a purpose and plan for us, and as Esther, has put us here for such a time as this. Esther 4:14 . . . and who knoweth whether thou art come to the kingdom for such a time as this? He puts us where he wants us. He wants us to proclaim peace and truth (Esther 9:30 And he sent the letters unto all the Jews, to the hundred twenty and seven provinces of the kingdom of Ahasuerus, with words of peace and truth), and bring glory to Him until this race on earth is done and we meet Him face to face. Ultimately, we are to bring glory to Him. Thank you so much for this! Satan has been telling me these same lies! I am retired and my children are grown, and I fight the feeling that I have no purpose anymore. It is so helpful to hear that someone else in this situation is experiencing the same thing. Thank you! Thank you, Inez, for stopping by and being and encouragement to me. This is something I need to remind myself of often. I’m so thankful for the Word of God which encourages me daily and I pray I can be an encouragement to others and to my children and grandchildren. In this day we need each other for encouragement and reminding us that God is not finished with us yet.